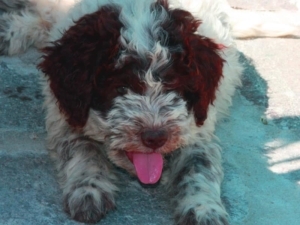 How long a lagotto can bear our absence? Will my dog bear few hours of solitude? The companionship of man for every dog of any breed both as a puppy and as an adult is a need. A dog left alone too long accumulates anxiety. A dissatisfaction lagotto romagnolo show his felling with the destruction of objects, digging in the garden or on the couch. A sad and unfulfilled expression or excessive excitement at our sight will soon lead him to be a not polite and rude dog. Business commitments often keep us out during the week and the time to devote to our furry friend may not be enough. It’s necessary find a balance between to live together at our dog only the weekend (absolutely insufficient) and only a part of the day. 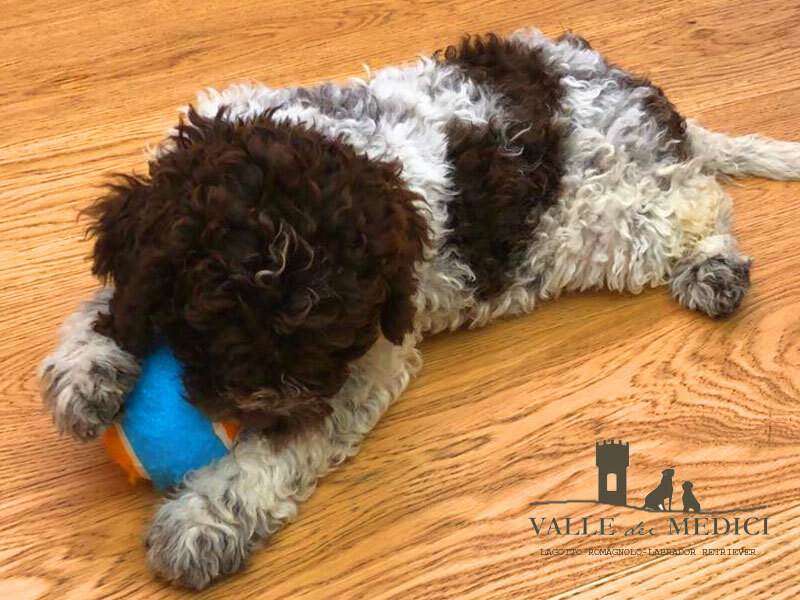 It is impossible to accustom a pet dog and more and more a lagotto to live without his family all day long for five days a week. You can certainlly teach your lagotto to spend a part of the day without his family. 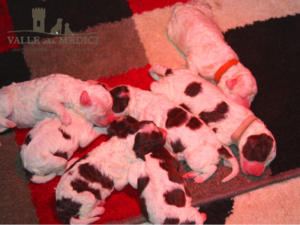 Some families organize on time the day of the arrival of the puppy. They manage to take a Friday and/or a Monday of holidays to follow accuratly the first days of the puppy in the new house. Still in the first days you can teach the puppy to spent serenely some hours of the day by himself. You can simulate your absence even if you are present . You will propose short periods of the day without you. Then the periods will be progressively longer until we get exactly the typical day. Placate your and the children enthusiasm is always good thing. Let the puppy look for you, then you can cuddle him. This is an exercise that we usually do here with the new family before the foster care and start the journey. When the puppy will need to rest it is the opportunity to get away and to get him accustomed to not having anyone near. It is important that since the earliest days the puppy is also by himself. Upon our arrival you will be careful not to excite him any more than he already is, just for seeing us. The greeting will not be the first gesture and we will approach him when we have the feeling that he has relaxed. It would be good method behave also with an adult dog. It helps him in self-control. We will leave the puppy alone in his “lair” for a few minutes. We will gradually increase the time of solitude even when we are present. We will be able to evaluate his behavior and increase or decrease the time of loneliness according to his reaction. Even when we understand we have demanded too much at our little we will be careful to control our emotions. We will avoid running to him and pamper him because we feel like to have done him a wrong. We did not! The message is not: “Complain, so I’m running to you!” Again, we let him to see or hear us but we will be envolved ourselves to other things for a few seconds . Then We’ll take him with us. And we cuddle him more we can! if a part of the period we are absent the dog Lagotto spent it to sleep, surely it will be quiet. wily No! Ahah, then: playing or walk or a meal will help him to doze off and lose redundant energies.